Are these Warragul’s biggest Tigers fans? Warragul isn’t quite Tigerland, but we do have our fair share of Richmond FC fanatics. 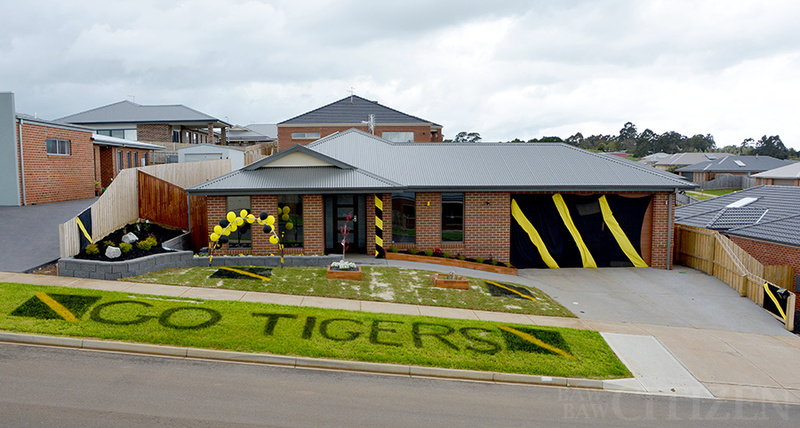 Following last weekend’s preliminary final win against Greater Western Sydney, one household of Tigers fans got decorating to support their club in this weekend’s grand final. The result, as you can see, is striking. Richmond will face the Adelaide Crows on Saturday, and hopefully the people behind this display won’t be taking it down with a heavy heart come Sunday. Richmond’s last premiership was in 1980 against another bird-themed team: the Collingwood Magpies. What other AFL bunting have you seen around Baw Baw? Post your spots on our Facebook wall. Click here to check out the South East Free Press’ follow-up to this story.